Central Grocery Company, at 923 Decatur Street in the French Quarter, is a small, old-fashioned Italian-American grocery store. Salvatore Lupo, a Sicilian immigrant, opened the store in 1906 and operated it until 1946 when he retired and his son-in-law, Frank Tusa took over. Today it is owned by Salvatore T. Tusa, Salvatore's grandson and two cousins. 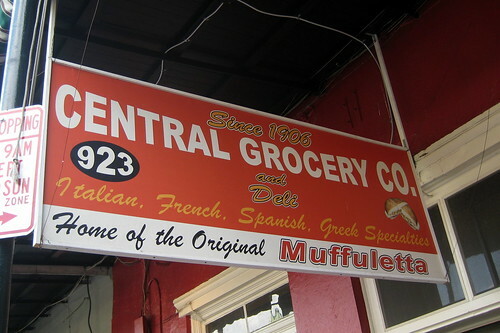 It is famous as the original home of the muffuletta, which Lupo invented to feed the Sicilian truck farmers who sold their produce at the Farmer's Market. Pronounced moo-foo-LET-ta by the Central Grocery proprietors, or muff-uh-LOT-uh by locals, or simply referred to as a "muff", it was only known locally known until the late 1960s. As tourism in the French Quarter grew, so did the sandwich's fame. A typical muffuletta consists of one round muffuletta loaf, about 10 inches wide and split horizontally. The loaf is then covered with a marinated olive salad, then layers of capicola, salami, mortadella, emmentaler, and provolone. The olive salad is considered the heart of the sandwich, and consists primarily of olives, along with celery, cauliflower, carrot, and seasonings, covered in olive oil and allowed to combine for at least 24 hours. The crowded storefront offers modest seating in the back, but most take their large muffuletta to go...and usually with a bag full of other Italian, French, Spanish and Greek table delicacies including less mainstream selections like chocolate covered grasshoppers and bumble bees in soy sauce.